I have a massive ‘foodie crush‘! Yes, indeed, I am head-over-heels. And his name is David Wolfe! My crush started as a mild interest a few weeks ago when I stumbled across one of his videos on YouTube. And I have logged hours ‘at his feet‘ ever since. I have bought two of his books, have watched hours and hours of video footage, and have adapted many of his suggestions, especially concerning Superfoods. So…I was already well on my way to falling in love when, last night, my crush spiralled into an all-out, losing sleep, can’t-stop-thinking-about-it crush. So, you ask, what happened last night to catapult me into the realm of the star-struck teenage girl? I watched David Wolfe’s Tedx Talk on raw chocolate! 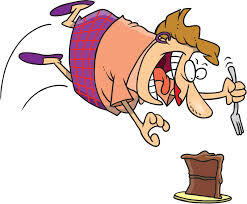 I am a die-hard chocolate lover! And, at 8:00 last night, I was told, in no uncertain terms, that my absolute all-time favourite food in the whole-wide-world is ridiculously good for me! And, he does it all in The Second Circle which is just that much more delicious! I could continue to wax poetic but, really, what more is there to say? If you feel about chocolate the way that I do, I just need you to go and watch that Tedx Talk. I am a rule follower. I have been a rule follower all my life. I’m not particularly proud of my rule following, per se, but it has always kept me on the right side of the principal’s office which has worked out pretty well for me! In the past few years I have worked very hard at shifting my adherence to rules. The ones I find hardest to break are the ones that I set for myself. Things like; don’t eat after dinner, no sugar, no potato chips, no caffeine, no alcohol (especially if I’m alone), get up early, work first, then play and exercise every other day. I have deep admiration for the rule-breakers of the world (my beloved husband being one of them) but I just can’t seem to climb onto that particular bandwagon. Our local chocolate shop has a sign in the window that says; ‘Life is Short. 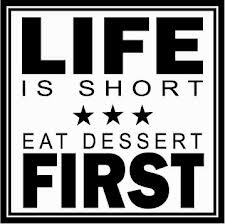 Eat Dessert First’. And, I have to admit, as much as I love that pithy rule-breaking saying, I do not practice it. I am on Day Two of my wonderful northern retreat. I have finished my work for the day and am now entirely without have-tos, coaching calls, client calls or day-to-day business maintenance for the next five days. I can relax and settle in to the solitude and freedom of my retreat. To celebrate my aloneness, I have a beautiful fire going and I am sitting with my laptop and a glass of delicious red wine…another broken rule…drinking alone! Oh dear! I awakened late this morning after a fairly rough night. My eczema flared at 3:00 this morning and I thought I was going to go insane with the scratching of my right foot. And so, rather than succumb to the breakdown, I got up and put together a gigantic pot of homemade chicken stock. At 5:30 I settled back into bed and awakened at 8:30 feeling a little groggy and disoriented. Regardless of where I am, my morning ritual is a cup of Vanilla Rooibos tea followed by a kale and spinach smoothie (see…I told you I was a good girl!) This morning, however, I had a wicked craving for a giant cup of mint tea and a sizeable slab of the Raw Chocolate Mousse Pie that I blogged about a few days ago. Chocolate pie for breakfast? No way! Yes way! At 9:30 this morning I tucked into a giant piece of yumminess…and it felt absolutely rule-breakingly wonderful! Drinking alone, pie for breakfast…what else am I going to get up to this week? My family has a lovely little late-afternoon ritual that we call ‘Cookie and Tea Time’. It happens somewhere between 3:00 and 4:00 in the afternoon and is a wonderful moment to sit, relax and have a break before the craziness of the dinner hour sets in. ‘Cookie and Tea Time’ used to include a cookie or three but those went by the wayside when I gave up gluten and dairy. 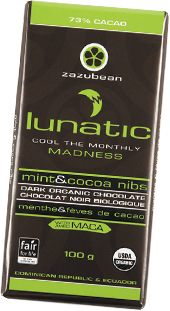 For the past three years, my ‘cookie’ has been a few squares of organic, fair trade dark chocolate (and my all-time favourite is the Zazubean Lunatic Bar). My neighbourhood health food store stocks the Lunatic so I always have access to my favourite treat. If I am going away on holiday I stock up on oodles of Lunatic Bars because my nieces, nephews and children know if I am around and have a cup of tea in my hand, dark chocolate is somewhere in the picture. My niece, Evie, just turned two and I think perhaps she is a little confused as to whether my name is ‘Aunt Katie’ or ‘Chocolate’. Regardless, she knows that the minute I show up at her house and the kettle is on, the distinctive green and brown bar will slip like magic from my purse and its contents will delight. Three weeks ago today I received a myriad of test results from my Naturopath. A kill protocol for high yeast was her among her various treatment recommendations. If you’ve ever done a kill protocol you will know where this is heading…NO sugar! No cane sugar, no honey, no agave, no maple syrup…absolutely no sugar! Rather than falling into a chocolate deprivation funk, my Radical Act was to find a recipe, adapt it to my needs and make my own chocolate. And so, I have combined a high protein Raw Power Bar recipe with a raw chocolate topping and created a no-sugar, low Glycemic Index treat. 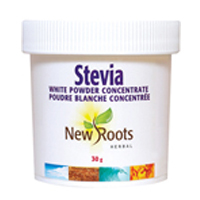 And the secret is New Roots Stevia Powder. So now, Cookie and Tea Time is as relaxing, delicious and as chocolaty as ever!